Strongest Atlantic hurricane outside the Gulf of Mexico and Caribbean. Irma set this record in two ways: top sustained winds (185 mph, beating the 175 mph from Hurricane Andrew) and lowest central pressure (914 mb, just ahead of the 915 mb estimated for Hurricane Isabel in 2003). The only hurricane recorded anywhere in the Atlantic with stronger sustained winds than Irma was Hurricane Allen (1980), at 190 mph. Longevity as a behemoth. Irma racked up a 37-hour stretch with top winds of 185 mph. This beats the global record of 24 hours at or above 185 mph set by Typhoon Haiyan in 2013. Irma spent a total of 3.25 days at Category 5 strength, most of it in a long stretch from Sept. 5 to 8. This puts Irma in a tie with the 1932 Cuba hurricane as the Atlantic storm with the most hours at Cat 5 strength. Before Irma, no Atlantic storm in the satellite era (1966-present) had racked up three consecutive days as a Cat 5. Only Hurricane Ivan (2004) spent more time as a major hurricane (Cat 3/4/5) than Irma’s 8.5 days. Strength at landfall. No hurricane as strong as Irma had ever been confirmed in the Leeward Islands region (defined by Klotzbach as 15 – 19°N and 60 – 65°W). The previous record-holders were the Okeechobee Hurricane of 1928 and Hurricane David (1979). Both of these hit the Leeward region with winds of 160 mph, and just like Irma, both hurricanes went on to strike Florida. Irma’s landfall on the north coast of Cuba made it the first Cat 5 to strike the nation since the Cuba Hurricane of 1924. Fortunately, Cuba was spared the more intense north side of Irma. From the Juxtaposition Department: the paths of Irma and Hurricane Wilma (2005)—the last major hurricane to strike Florida before Irma—coincided over Marco Island, Florida. Both storms made landfall at 25.9°N, 81.7°F as Category 3 hurricanes. Another path quirk occurred in the open Atlantic this month: on September 8, near 16.9°N and 59.2°W, Hurricane Jose (Cat 4 at the time) passed over the track carved out by Hurricane Irma as a Cat 5 storm less than three days earlier. “I’m not sure if that’s a record for two major hurricanes, but it’s got to be close,” said Klotzbach in an email. An ace at ACE. Accumulated cyclone energy (ACE) is a function of a hurricane’s peak wind speeds and its longevity. It’s most relevant in the satellite era, where we have more consistent and frequent estimates of top winds. Irma produced more accumulated cyclone energy (ACE) in a 24-hour period than any other Atlantic storm on record, beating Allen (1980). Irma’s total 67.5 units of ACE puts it within the range of 61-111 units cited by NOAA as being near-normal for an entire Atlantic hurricane season (!). It’s also the second highest ACE for any Atlantic hurricane in the satellite era, once again trailing only Ivan (2004). Note: all else being equal, a larger hurricane will pack more energy than a smaller one, but wind-field size hasn’t been incorporated in the definition of ACE, since the size data were not included in official databases until fairly recently. Here are peak wind gusts and top rainfall totals from Irma observed across the Southeast U.S., as reported by the NOAA/NWS Weather Prediction Center in its final statement on Irma as a post-tropical cyclone, issued at 5 pm EDT Monday. Many of these readings are unverified, so we’ll have to wait for more in-depth analysis to find out which of Irma’s peak rain and wind reports make it into the final record. Figure 1. Wind and rain from Hurricane Irma caused a tree to fall and break a utility pole on Monday, Sept. 11, 2017, in Macon, Georgia. Millions of customers across the Southeast U.S. were still without power as of Tuesday night, including more than 4.3 million homes and businesses in Florida alone. 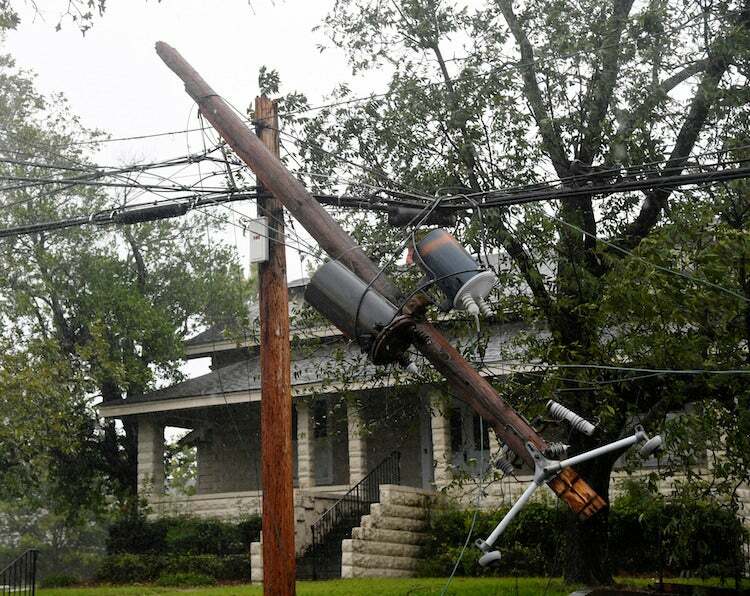 Image credit: Woody Marshall/The Macon Telegraph via AP.